Does I-522 really still have a chance? The initial results on election night didn’t look good for Washington state’s GMO-labeling initiative, I-522 — it trailed 46% to 54%, and only led in a few counties. After a lot more ballots were tallied on Wednesday, the outlook wasn’t much better. Message posted by the Yes on 522 campaign Wednesday. At 8:30 pm Wednesday, the updated totals still came in 54% to 46% against the initiative. (See the state's latest numbers here.) But many ballots still haven’t been tallied, so it is possible that I-522 still has a fighting chance? Because of Washington’s mail-in ballot system, many votes aren’t counted on election night and the results aren’t formally certified for weeks. The state does post estimates about how many ballots from each county are yet to be counted. (These estimates aren’t perfect, but they’re the best we’ve got.) If every single vote still uncounted on Wednesday night went to the Yes side, I-522 would end up passing with 60% of the vote. But every single vote is not really possible. So what can we see by digging into the tallies? I-522 is leading in only four counties, but one of those is giant King County — and about 30 percent of King County votes were yet to be counted on Wednesday night. Other big counties — Pierce, Kitsap, Snohomish — also have lots of votes left to tally. What if you assume each county’s uncounted ballots continue to follow the same percentages — would King County’s presumably high number of uncounted Yes votes be enough to tip the balance? No. We did the math, and if all the counties continue on their current trajectories, the numbers get slightly better for I-522, but only very slightly — an increase from 45.95% in favor to 46.29%. Even if you changed that assumption to say every single uncounted King County ballot is a Yes vote, I-522 would still come in just under 50%. So, for I-522 to have a chance, you have a assume all the ballots not yet counted are significantly more in favor than all the ballots already counted. Of the estimated 422,157 uncounted ballots, 258,527 would have to be Yes votes to gain the majority — that means about two-thirds of all remaining ballots. That’s very, very unlikely. But for those who want to hold onto hope, it’s not strictly impossible until more of the votes are tallied. Wondering if your vote has been counted yet? You can check here. UPDATE: Here's a quick look at where things stand after more ballots were counted on Thursday. It was an encouraging day for those hoping things could turn around, with the Yes side edging up to 47.05% of the vote so far. The overall number of estimated ballots increased, especially in King County — not surprising, they have the most to keep track of — and that did make a difference in favor of I-522. Still probably not enough, though. Here are updated charts showing the difference between Wednesday and Thursday, and the updated trajectory based on ballots counted so far. UPDATE (11/13): Since the last update, the count has continued much the same way: The Yes votes have continued to gain ground, but almost definitely not enough. At the end of Tuesday, the vote stood at 48.25% yes, 51.75% no — the closest yet. But, because there are fewer votes left to count, it’s actually less likely that 522 will pass. It would need to get 83% of the outstanding votes. No ballots were counted on Monday because of Veterans Day. The counties making the most progress with tallying votes since last week are the big ones like King, Pierce, Snohomish and Whatcom. Many smaller counties list somewhere from 25 to 200 ballots left to count, and don’t plan to count again for a week or two when all ballots have surely arrived. 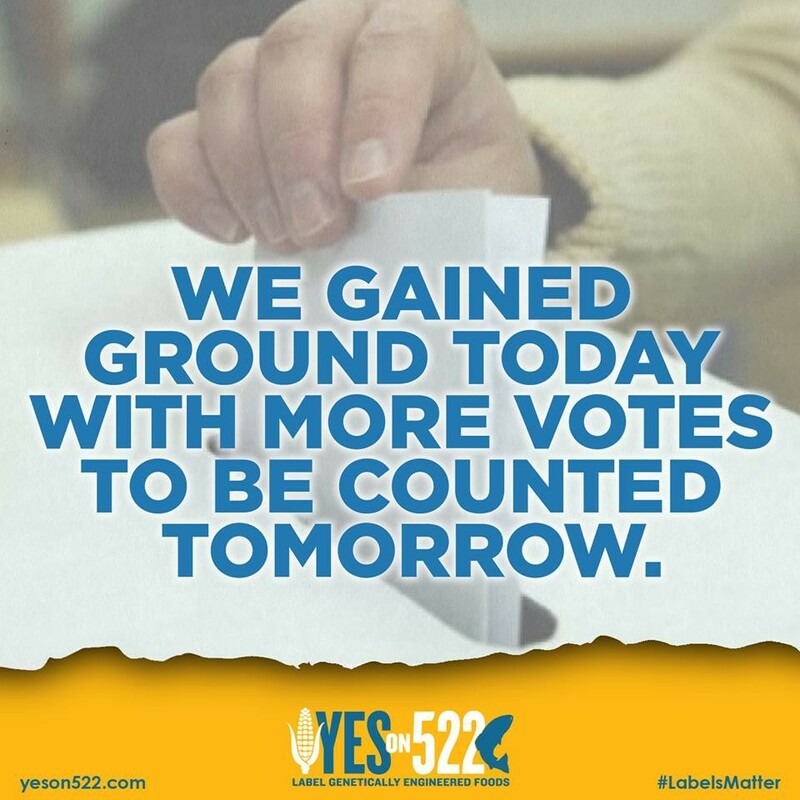 UPDATE (11/14): After votes were counted on Thursday, the Yes on 522 campaign officially conceded. With nearly 49% of the vote, it was close — but there are no longer enough uncounted ballots to make up the difference. The numbers will continue to shift a bit as the rest of the votes are counted and results are properly certified, but this is the end of our daily tracking. Here's the full post-mortem, this time showing the precise number of votes so you can see how the total increased as ballots arrived the first few days after the election.